My sincere thanks to Per for finding and photographing the images as well as writing or translating the text for this page. He has done an excellent job, and should be congratulated. Poskær Stenhus is to the north and east of Knebel. 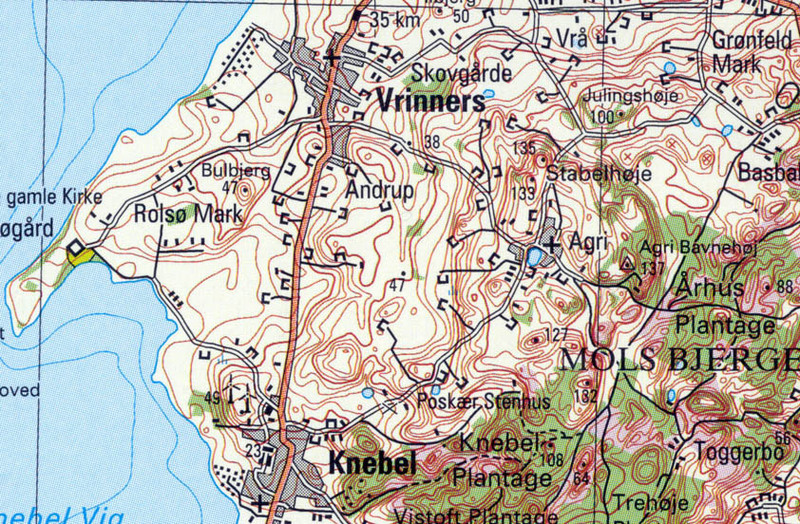 Stabelhøje is directly north of Agri. The mound to the extreme right in this panoramic photo is the 135 metre altitude one on the map. This panorama of Ugelbølle school-yard was taken in July 2002 from the northern part of the bay. A little to the left of the middle is where the picture above is taken from. Besides demonstrating another perspective, this shows what Danes like to see here; a lush green landscape. This was Denmark's first real farmer culture - "tragtbægerkulturen" (funnel beaker culture, a name given from the shape of their ceramics) - who erected this huge "runddyse" (a round shaped stone house) around 3 500 BC, as a burial mound. Poskær Stenhus is Denmark's biggest "runddyse". 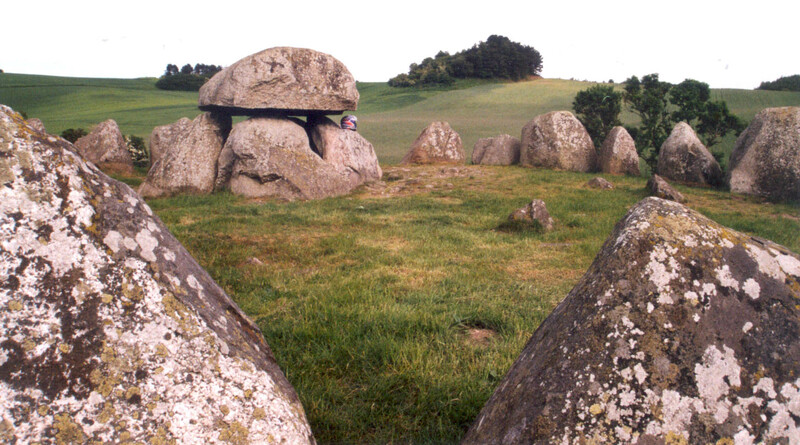 The "tragtbægerkultur"'s early earth-constructed "langhøje" (long-mounds, or gallery graves), "dyserne" (dolmen) and the slightly younger "Jættestuer" (Jætte = Giant, jættestuer = giant-mounds) are the oldest visible burials we know of (in Scandinavia anyway). Most are partly or completely destroyed, being "recycled" as construction material for churches or used as a filler for roads. A stone-mason in Århus bought this stone-house in the 1890's, but with the words : "A forby'r et i Kongens og Lovens navn" (In the name of the King and Law, I forbid you) it was luckily saved by the local "Sognefoged" (administrative head of the local church parish) in Agri from such a fate. It's been declared a national heritage since. The fertile and undulating landscape of Mols is well supplied with Megalith-mounds from the neolithic and early bronze age. 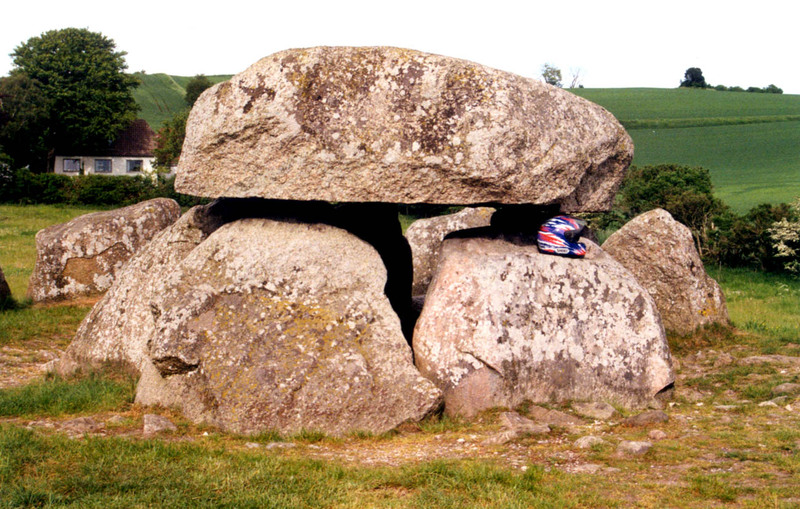 One of the most impressive "Runddyser" (Dolmen / Round barrow) in Denmark, Poskær- or Påskær- stone-house also known as Knebel-dyssen is located a little northeast of the village of Knebel. 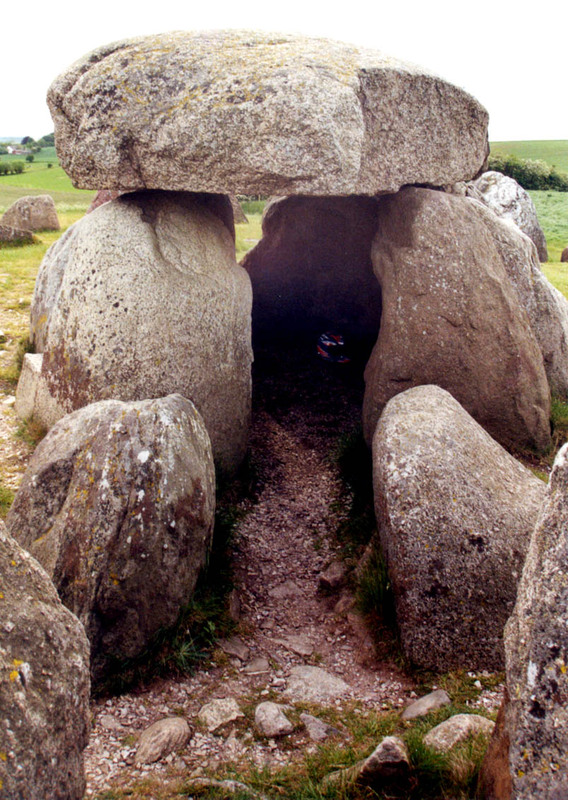 This ancient monument which was declared a National heritage site in 1860 (note the discrepancy in dates), has a hexagon shaped burial chamber made up of 5 uprights. It has two passage stones and a huge cap-stone. 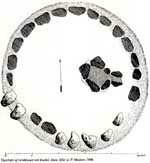 Surrounding them are 23 giant up to 2 metre high Kerb-stones in a circle with a diameter of some 20 metres. The chamber itself is placed to the eastern side of the circle, most likely because there were one or two more chambers inside the circle. This fine Dolmen was restored by the National Museum. Above Knebel-dyssen is a small dolmen and on the road to Agri are another three, among them a dolmen with a hexagon shaped chamber and a cover stone with nine "skålgruber" or cup-marks. A little to the west (typo ? I believe it's Agri-dyssen they are talking about) of Agri there's a dolmen with a huge cap-stone. There is an extraordinarily beautiful Dolmen made from four uprights and with cup-marks on the cap-stone west of the village of Torup, and the dolmen "Stenhuset" with a hexagon shaped chamber covered by a huge cap-stone is located northwest of Strands. To the west, between Strands and Klokkerholm is yet another dolmen with cup-marks on the paving-stones. Tree Clay vessels ~ Beakers and some amber-pearls were found in a rock casket north of Begtrup Vig. 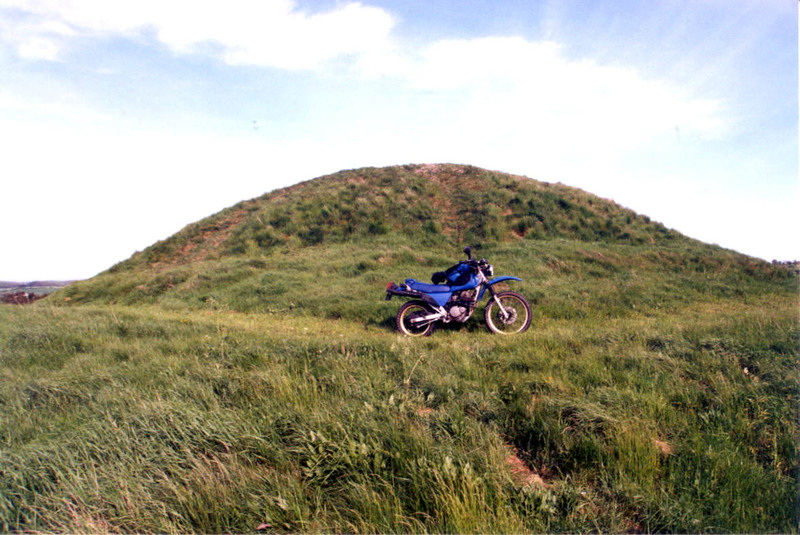 Among the most well-known mounds on Mols are the two Stabelhøje (133 & 135 metres) located on neighbouring hilltops, with good views over Mols Bjerge (literally mountains, of which we have none here in Denmark) and Kalø Vig. The area's many lookouts are the result of the enormous force behind the ice forced up through Kalø- and Ebeltoft- Vig during the last Ice-age. Other mounds in the vicinity are the 10 rather big Julingshøje (mounds) northeast of Agri and northeast of the village is the huge Rugdalshøj. Further south are the tree elevated ones, Trehøje (literally tree hills) in a group of 12 mounds. 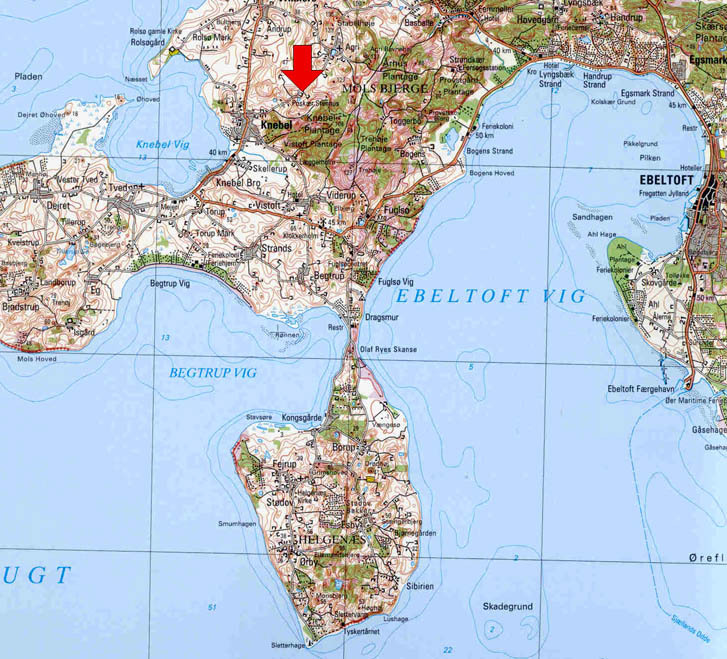 Source: "348 oldtidsminder i Jylland" = 348 prehistoric sites in Jutland by Henning Dehn-Nielsen. One burial-chamber is visible today. There were probably two originally. It's made from 5 split upright stones angled slightly inwards that have been covered by a huge, likewise split stone weighing 15 metric tons. The other half of it can be found on top of "Agridyssen" (Agri Bavnehøj? 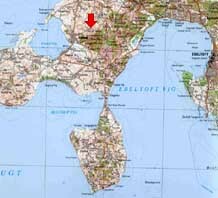 )(located to the east of Agri at 137 meters above Sealevel on the map above) aproximately 2 Km. from here. Outside the chamber there are two Portal stones that are the only ones left from an eastbound stone-made corridor to the chamber as in this photo. The chamber's southern column stones have been defaced by the masonries in the 1890's and off the possible second chamber there's a few "blown" stone residues to the west of the current chamber. Around the chamber and the now removed mound, there's a stone circle with 23 of the original 24 unusual big kerb-stones still there. The space between them and the chamber were originally covered with a so called "tørmur" (dry-wall) made from flat paving stone slabs. No discoveries were made during a minor excavation and restoration in 1943. Earlier plundering have removed any valuables, and organic materials are decomposed. Numerous skeleton parts have been found during excavations of similar mounds. It's been sugested that they had their flesh removed before the burial ceremony in the mound. We're also aware of vessels with food and drink, grave goods, placed in the mounds. 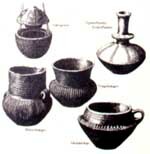 These ceramic vessels are the most beautiful we know from prehistoric time and have given their name to the people. "Storstensgravene" (Megalith-mounds) in the mystic "tragtbægerkultur". "Dysser" and "Jættestuer" are commonly called "Storstensgrave", or Megalith-mounds. Traditionally they where conceived as, especially "dysserne", as burial sites for the top of the society and far from all where buried here. Recent research shows that "storstensgrave" weren't just burial sites for individuals, but should rather be considered common-monuments in that society and as territorial markers. 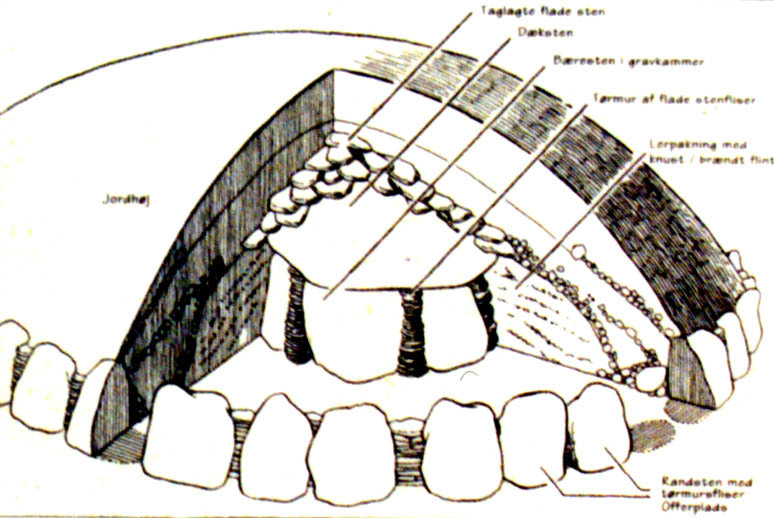 Since later cultures from Stone-, Bronze-, and Iron-age has reused the mounds for new burials, it's rarely possible to find an intact grave from the time of erection.